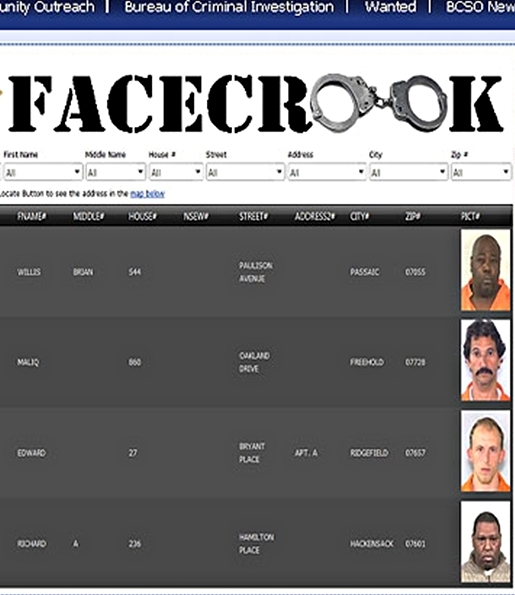 "Facecrook" features the names, photos and last locations of fugitives wanted by the Bergen County Sheriff's Office. New Jersey’s Sheriff office has put up a new website that features fugitives. “Facecrook” was the idea of Inspector Mickey Bradley. He bought the Facecrook.net domain for $17. This site feature a database of fugitives wanted by the Bergen County Sheriff’s Office. It also shows the fugitive’s names, photos and last whereabouts. The site also creates a map and allows users to give anonymous tips to authorities to catch wanted law breakers. Before you enter the site, the user must agree not to use it to “intimidate or harass another” , including a warning of “do not apprehend”, to discourage people from practicing vigilantism.